Between 19% and 33% of students in Grades 6 through 10 reported that they did not participate in organized sports. 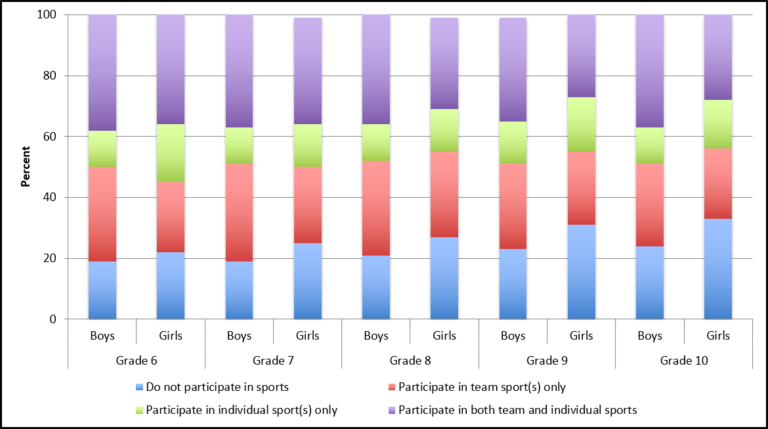 Girls were more likely than boys, at all grade levels, to report that they did not participate in organized sports. Twenty-seven percent of students in Grades 6 through 10 reported that they participated in team sports only, 15% in individual sports and 34% in both. Non-participation increased with increasing grades. Research demonstrates that girls are likely to undervalue and underestimate their capacity and potential for competency in physical activity. Teenage girls report more barriers to participation than do boys. These barriers include time, money, resources, and a concern for safety. In addition, girls may lack active, older role models and this may contribute to their to lower participation in physical activity.